You might recall the days of printers gone by, perforated pages and mono coloured ink that seemed to last all of one document before it needed changing. Of course, fast forward to today and you'll find a plethora of incredible pro printers on the market offering precision temperature sensitivity for ink management, along with ink distribution with such nuance that it requires a microscope to see the difference. When you are looking to buy a professional printer, you might have narrowed it down to Epson vs Canon pro printers. After all, these are two of the biggest names on the market and it makes sense to compare these giants if you're a discerning buyer looking for quality. But much like a high performance vehicle, you really need to "get under the hood" to see where the differences in the best pro printers lies. While a printer might look amazing, you also need something that is consistent, something that can print day after day, and be cost-effective for the studio photographer. At Total Image we are proud to be an authorised reseller and partner of both Epson and Canon. 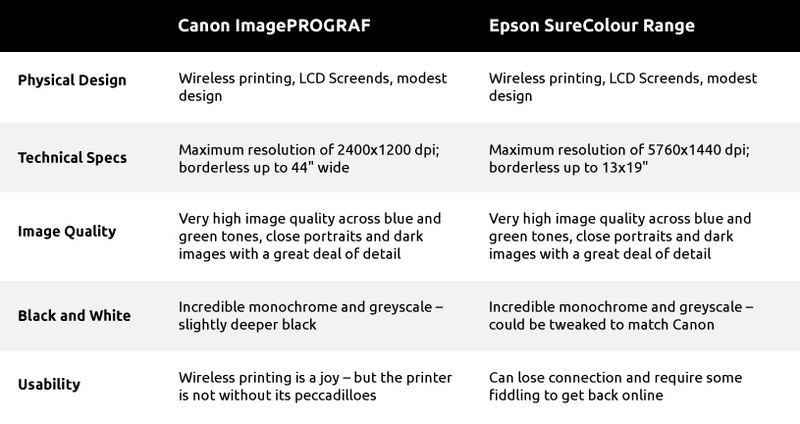 With that in mind, we have decided to compare the Canon ImagePROGRAF range and the Epson SureColor range so that you can understand the pros and cons of each when looking to buy. 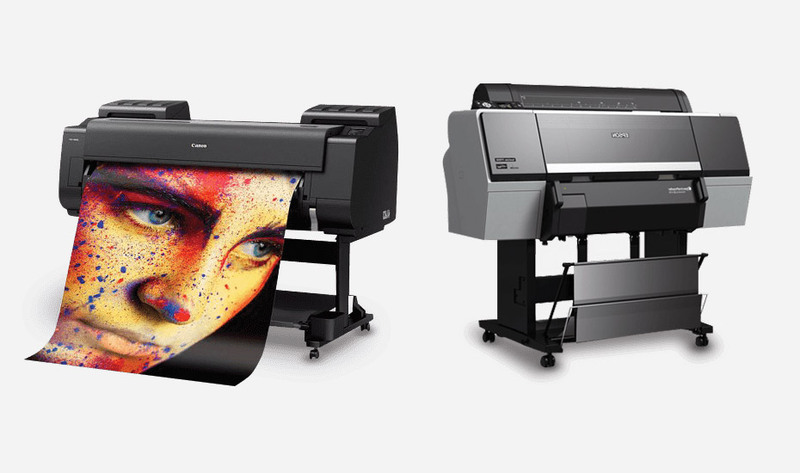 It's hard to choose a winner between these printers; both printers produce absolutely stunning images. We'll look into each of these factors in a little more detail now just for a better comparison. When it comes to both printers, you'll find that each has a range of convenient features and settings including LCD screens and fairly modest design. With that in mind though, when you are printing something, these printers cannot help but to look slightly awkward, with paper sticking out and expanded paper trays. But then, you're more interested in the end result, rather than what the printer looks like in action. Also, it's good to note that the Canon's print head isn't installed into the printer which means one more step for you. But then, this also means that you can replace the print head if it gets clogged beyond repair. Connecting these printers is simple, and you are spoiled for choice with your options. Want to use Apple AirPrint? No problem. Google Cloud Print? Yes, no problem there either. These printers are both constructed with the end user in mind, and boast a multitude of connection options, including traditional USB 2.0 and Ethernet. Ink output - 9-ink configuration using photo black, matte black, vivid light magenta, light black, light light black cyan, vivid magenta, yellow and light cyan. This printer can automatically switch between photo and matte black, but due to a shared channel there is some cleaning required between matte and gloss. Both printers perform equally well with regards to colour rendition and the overall tonality of prints generated at their highest resolutions and with all high-speed settings disabled. When printing at the highest resolution, the Canon printer will take a slight win over the Epson printer, but the difference is incredibly marginal. Let it be said that each printer performs magnificently at a grayscale or black and white printing level. Each printer has the capacity to generate stunning grayscale and black and white atonal images. Users have the option to adjust the Epson output in Photoshop and it will easily stand up to the Canon's natural deeper black ink. When it comes to the usability of any tech product, there seems to be a certain point at which technology can only go so far. While each printer is effortless to use and can hardly be faulted for performance, there are a couple of bugbears for connectivity. From time to time, each printer might "drop out" from connection and then cause problems when trying to print. Wireless printing from almost any device does ease the headache caused by this, as does the relatively quiet printing from each. No matter which printer you opt for, know that you are making a fine choice as far as the best pro printers are concerned. 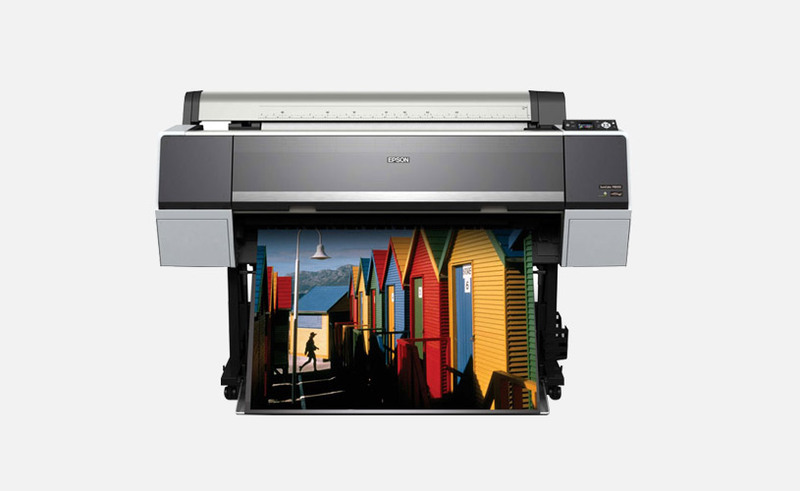 Canon is a firm favourite for many studio photographers, while the Epson printers continue to perform year after year. We rated each brand nine out of ten because we believe that each is a superior product at the top of its class. Our only small grumble was with the connectivity, but again this was only intermittent and could easily be rectified. If you would like to find out more about any of our stunning printers or other printing equipment, call us on [phone]. 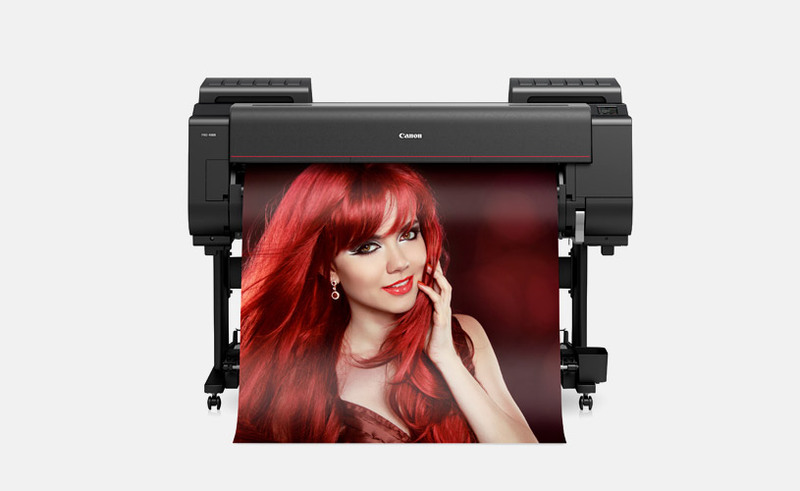 We are based in Melbourne and are only too happy to offer advice and guidance on making the right choice when it comes to purchasing Epson and Canon pro printers. Alternatively, browse our range online and if you have any questions or would like to know more, feel free to send us a message and we will get back to you.